A young soldier's honest portrayal, told through letters home and a frank journal, of his enthusiasm for the 1914 recruitment campaign, and joining up - followed by the disillusionment and degradation of soldiering in the trenches of World War I. Sixteen-year-old Sydney is overwhelmed by the excitement of the 1914 recruitment campaigns and the bravado of men leaving for the Great War. Bursting with enthusiasm, he runs away to join up, but soon finds himself a long way from home in a frontline trench where reality - and the rats - begin to bite. Told through Sydney's optimistic letters home and his journal, this is his honest portrayal of the disillusionment and degradation of life and death in the trenches of World War I.
IAN BENFOLD HAYWooD studied Fine Art at the Nottingham School of Art and Design and Illustration at the North Wales School of Art & Design. He has painted in Spain, worked as a community artist and been an art teacher, been marketing manager for a Japanese company and established his own business supplying components to the major audio-logical manufacturers in Europe - as well as illustrating a number of children's books. Ian lives in Chester. 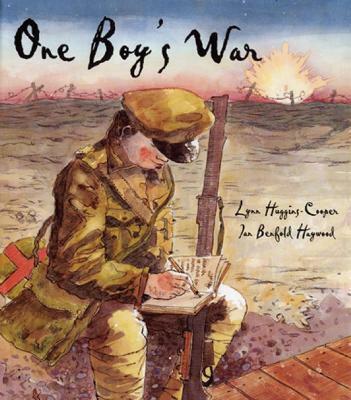 Lynn Huggins-Cooper has published over 100 books for children, including picture books, educational and nonfiction titles. She is the author of multiple revision guides and workbooks on maths, science, and technology, including the popular Letts Magical Skills books.